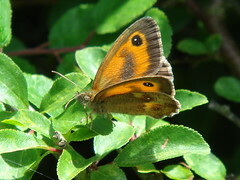 Along the sheltered hedgerows, Gatekeepers, Speckled Wood, Small Skippers and other butterflies abound. Great Green and Dark Bush-crickets chirp their strident 'songs' while Bumble Bees feed on the purple spikes of Tufted Vetch. Young Treecreepers and Woodpeckers are leaving the nest, begging noisily to be fed. Migrating Spotted Flycatchers and Willow Warblers feed up before the long flight to Africa. At night, the huge variety of woodland moths are eagerly hunted by Pipistrelles, Noctules and other bats. On the woodland floor the delicate white flowers of Enchanter's Nightshade may carpet the ground. Activity on the cliffs has diminished as young Guillemots and Razorbills have left the nest - before they can fly! Shags, Herring Gulls and Great Black backed Gulls remain with their young, while Fulmars are also still feeding their late-hatching chicks. 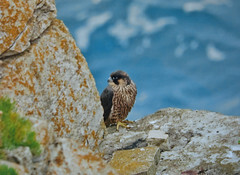 Newly fledged Peregrine Falcons and Kestrels try out their hunting skills. Further offshore, Gannets, Manx Shearwaters or even a Storm Petrel may reward an evening seawatch. Along the clifftops the nectar of specialised wildflowers like Rock and Golden Samphire may provide food for newly arrived migrant Red Admirals and Painted Ladies. Wild Carrot, Common Mallow and Teasel provide more splashes of colour. Dolphins are generally scarce this month but still worth keeping an eye out. Overhead, Ravens may soar by, while Swifts, Sand Martins and other early autumn migrants are already heading south. The short downland turf is bedecked by the low-growing Eyebright, Centaury, Carline Thistle, Squinancywort and Wild Thyme - to name a few. 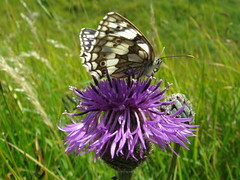 The rare Lulworth Skipper and beautiful Chalkhill Blue may be seen, while Marbled White and Meadow Brown butterflies are particularly noticeable in the meadows, where the vivid black and red 6-spot Burnet Moth also abounds. The 'songs' of male Meadow Grasshopper is the commonest sound. 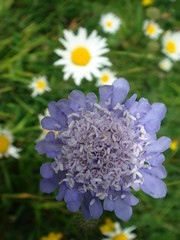 Wildflowers are at their best, the blooms include: Agrimony, Greater Knapweed, Field Scabious, Wild Carrot and Yellow-wort. Pyramidal Orchids also in flower and look out for the subtle beauty of Grass and Yellow Vetchling. Young Linnets join their parents to form large twittering flocks while noisy families of Whitethroats feed up before the long flight to Africa.